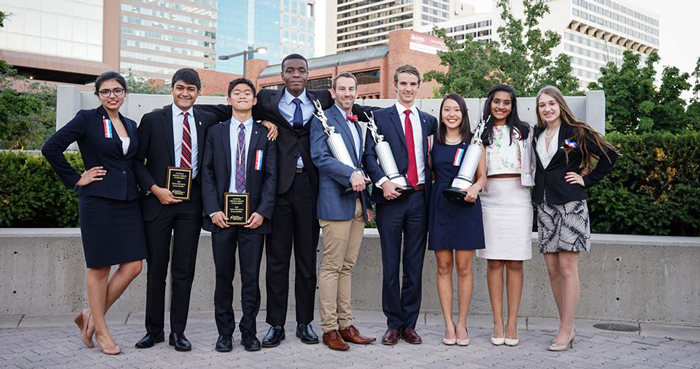 Since 2007, DA Speech and Debate has had ten teams finish in the top 10 and five teams place in the top three at the national championship tournament. In recent years, Durham Academy debaters have won major tournaments such as the Harvard University tournament and the North Carolina state championship tournament. But our success hasn't made us snobby — we're also a fun group that welcomes all students, no experience required. Comprising more than 60 students, the team holds regular practices throughout the week for each event, but students often come to additional practices as they see fit. Students who wish to compete locally in North Carolina tournaments aren't required to attend a minimum number of practices, but of course, the more often students practice, the faster they progress. To join the national travel team, there are more stringent requirements. But the advantages of joining the travel squad are many, including travel to wonderful college campuses and cities around the country. When they're ready, team members compete in speech and debate tournaments throughout North Carolina, testing their skills against debaters from other schools. Varsity-level competitors have the opportunity to travel to national competitions, usually on university campuses. If you're not already a member of the team, and think you might like to join, stop by one of our practices, or contact one of our coaches. There are no try-outs, and we're always glad to have new team members. You can always find more information at www.dadebate.com.